Anime Inspired Replica Blood Sword With Coordinating Scabbard | BUDK.com - Knives & Swords At The Lowest Prices! Add another stunner to your ever-growing collection of quality, anime-inspired replica swords. This Blood Anime Sword features a polished, 32" 440 stainless steel blade with a heavy blood groove. A uniquely shaped black tsuba meets an imitation ray skin and black cord-wrapped handle complete with a menuki ornament. A hardwood scabbard completes the concept. great sword. well made even though dull and heavy. I liked how the back was sharpend like in the anime when she would cut her hand and run her blood into the groove. all in all 5 out of 5. I LOVE THIS SWORD.Longer and heavier that i thought but it is truly a great sword not sharp double edged and the thumb cutter is sharp too just like the anime THIS IS A MUST BUY AND A GREAT PRICE love it and the anime thx true sword expect me to come buy the other two blood+ swords! Quite honestly, this was my first sword and i am completely satisfied. This sword is just awesome. Its a lot longer than I expected, heavier too. The blade itself is pretty sturdy, not all that sharp though, but that isn't a problem. 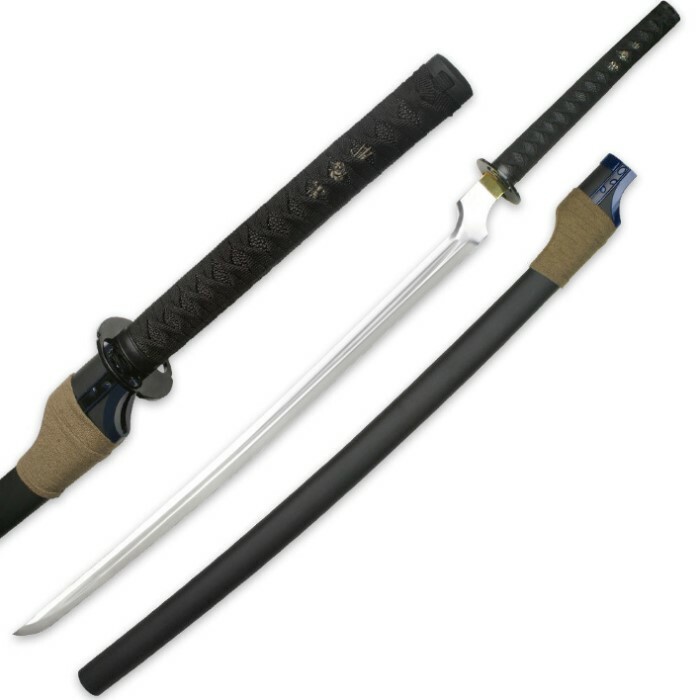 I would definitely recommend this sword to any one who likes swords and anime. This is my first purchase along with the Titanuim Ninja-To and it certainly won't be my last, TrueSwords rocks! Very nice replica however there were parts the the blade that were just exceptionally dull. At the tip it still looked like a chunk of steel with no effort into the sharpening and some places throughout the edge were duller than the rest. Yet I would still recommend this to any Blood+ fan out there. Looks pretty much how it did in the anime. Also extremely nice shipping time! A pretty neat sword, not for fans who want accuracy, though, for that I recommend the newer one on this site. I got it because of how unique it is, even if it is a rat-tail tang. love the show, love the sword great size everything is perfect but it is not sharp but that can be changed. I ordered this sword on thanksgiving day the 27th and it was at my door the next week on the 2nd. The sword is great size and style could not be any better for such a great price it is truly a must have sword.